How to make my work day a bit more fun? How to settle my growling stomach in the office? I need some sweet and healthy snacks! 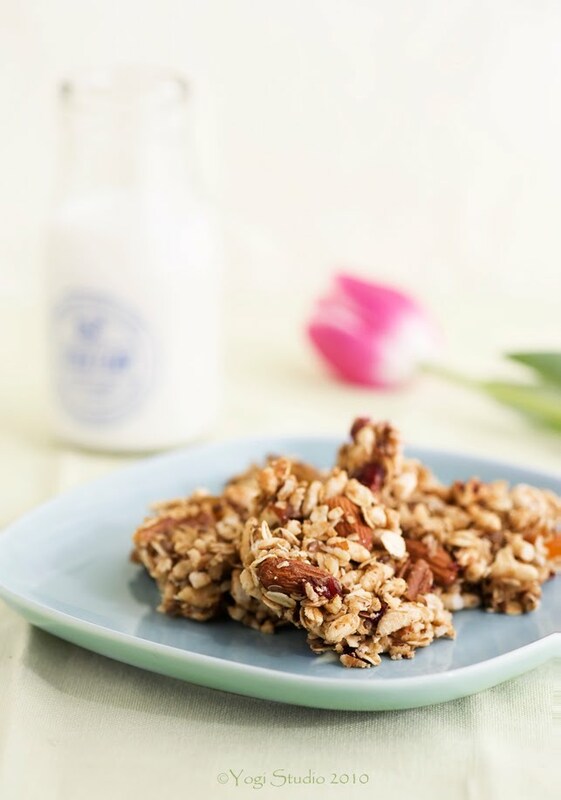 This granola is perfect for breakfast or snack at any time. It is with different varieties of nuts, maple syrup and honey as sweetener, and just 2 Tbsp of butter. I have been experimenting with different proportion of dry ingredients, sweeteners and oil for a long time. 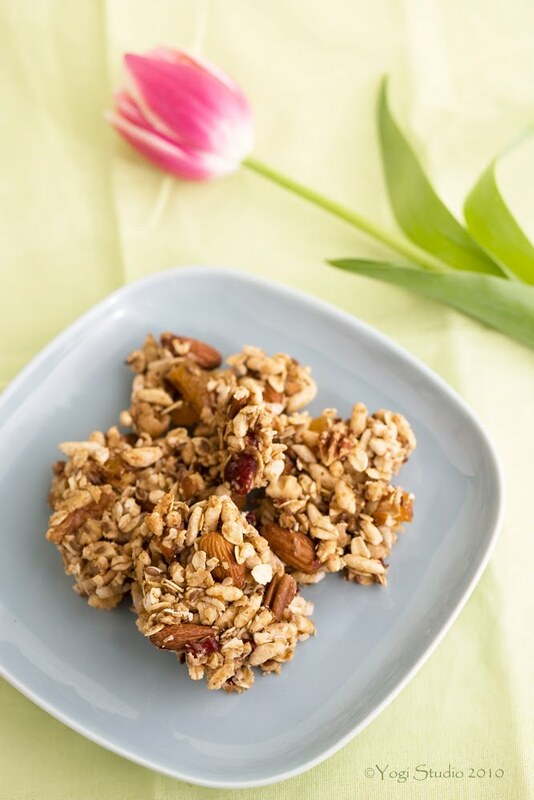 I like this combination the best because it is crunchy and yet the granola sticks together in cluster without too much oil and sugar. Maple syrup is essential in getting the great taste, honey only is just not good enough for me. But you can play around with different combination of nuts and sweetener to suit your own taste. Preheat oven to 350F. Spread oats, all the nuts, seeds and wheat germ on to a baking pan. Toast the ingredients for 12mins. Add in the puff rice and toast for another 3mins.. Remove nut mixture from the oven. Reduce oven heat to 300F. Let the nut mixture cool down for a few mins. Put 1/3 of the nut mixture in food processor and pulse it several time until the mixture are crumbly and the nuts are broken into small pieces but not powdery. Mix the processed nut mixture with the rest of the nut mixture in a large bowl. You can skip this step if you use chopped nuts. But I like the different texture with different size of nuts. Combine butter, maple syrup, honey, sugar, salt and vanilla extract in a saucepan over low heat. Cook and stir constantly until the sugar is dissolved and the mixture comes together smoothly. Pour sugar mixture into nut mixture. Put in dried fruit. Stir to combine. Put mixture onto a baking pan lined with silpat. Press down and form the mixture into a single sheet of around 1/2" to 1" thick. Put it in the oven and bake for 20 to 25 mins until the granola turns golden brown. Remove from the oven and let it cool. Break into small pieces. You can keep it in the fridge for at least 2 weeks. I tried to make these into bars before but I found that more oil and sugar was needed in order to prevent them from crumbling when cutting. If you just break them into bite-size clusters, they are still easy to eat and store without crumbling too much. I love stuff like this and i will definitely try. Anon - Please do try it. Thanks. lovely! this looks so great and healthy. i always keep granola in my desk at work (better than candy from the cafeteria) but this looks much better! yummy and sticky! gorgeous blog! just came over here from hannah of honey and jam .coms tweet. beautiful blog u have! Katy - I agree. Granola is much better than candy. But the problem is that, once I open my box of granola at work, I can't stop eating until I finish it! Nadi, Anon - Thank you. Glad you like the blog!